Search Marketing Professional - Experienced in Paid and Natural Search - this is my thoughts on the Search World we live in! Was having a look on the Google LatLong blog today and thought this was a really cool idea. 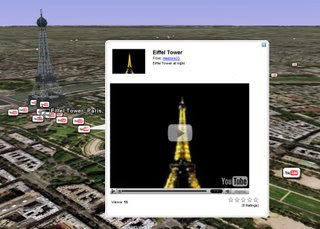 In some cases now on Google Earth you can play videos of what you are looking at. It seems like the obvious natural progression after we have had detailed pictures on there that are clickable for about a year now. The video's will be geo-targeted across Google Earth meaning again that you could find any videos you may have done and tagged geographically or with a specific landmark name will start to appear to the masses of dedicated Google Earth users. Great idea and as an online marketer I will be looking at ways to utilise this content opportunity! Everything here is personal opinion and is by no way and opinion of anyone who may be mentioned on my blog. Who wants to be a millionaire with Google?